Irancell Telecommunications Services Company CEO said: Nine cities including Uromiyeh, Babol, Tabriz, Tehran, Qom, Karaj, Mashhad and Hamedan have come under MTN Irancell 4G network coverage, having 50% population coverage. According to the Public Relations, talking this morning in the MTN Irancell 4G Commercial Launch Ceremony, Mr. Alireza Ghalambor Dezfouli stated: All provincial centers across the country will have complete 4G coverage by the end of the current year. This comes while only 5 provincial centers, with minimum 10% geographical coverage and 5% population coverage, should be covered in accordance with our obligations under the License Agreement. At present, 75 cities of all 31 provinces across the country enjoy MTN Irancell 3G services. In sync with offering 3G, we have started to provide 4G services as well which led to rolling out broadband Internet immediately after commercial launch of 3G services. Dezfouli also reiterated: The 4G services provision was kicked off on 20 November in Mashhad, followed by Karaj where we started the services on December 01. And today, the 4G services are commercially offered across the country. Touching on 4G technology development timeline, he observed: In 2004 NTT DoCoMo of Japan proposed LTE as the international standard. Then, in 2007, Ericsson, in collaboration with DoCoMo of Japan, demonstrated the pilot of LTE with bit rates up to 144 Mbit/s and 200 Mbit/s. Dezfouli also reiterated: In 2008, the Radio Communications Unit of ITU defined the standard requirements of the LTE and in 2009 Nokia Siemens and LG demonstrated the first complete performance of LTE. He added: The first LTE network available to the public was in the Stockholm and Oslo by the leading network operator TeliaSonera. The first GPRS service lad been commercially launched by the said operator in 2000. Dezfouli also reiterated: In 2010 Verizon Wireless launched the first LTE wireless services in 38 markets of the US where the download speed was 5-12 Mbit/s. SK Telecom and +LGU launched the first LTE of South Korea in 2011 in Seoul. The first LTE of Middle East was launched in 2012 by Etisalat of United Arab Emirates. Orange launched the first LTE network in France in 2013 and now MTN Irancell launches the first LTE of Iran in 2014. Stating that LTE is the 4th generation of mobile phone networks technology, he pointed out to some most important advantages of the technology: More bandwidth which allows for transfer of larger files in a short time, development of network responding time which enables real time communications and development of network performance which permits establishing connection and keeping it while in movement at a high speed, are but a few of the LTE advantages. Dezfouli also reiterated: LTE empowers the users with the distinguished quality of the data services: download rate of 10-40 Mbit/s, upload rate of 1-15 M bps and responding time of 50-150 millisecond, and more widespread usage extended to further areas including education, transportation, LBS, entertainment and health. He reiterated: "Currently, 331 LTE and 603 3G networks are officially operational in 112 and 216 countries, respectively". Speaking on the global trend for using mobile data, MTN Irancell CEO said: "The monthly traffic for mobile data is predicted to be 15 Exabyte in 2018, which shows nearly 11 times increase in the traffic rate for the period of 2013 to 2018." He further added: "The total number of electronic devices which are going to be connected to each other using mobile technologies, including M2M devices, is predicted to reach 10 billion by 2018. The collective increase in mobile data usage in the MENA region is also expected to hit 70%." While pointing that the collective increase in mobile data usage in the MENA region will reach 70% by 2018, he declared: "The trend for mobile data usage is expected to be 9.4% in the MENA region, 18.6% in North America, 42.4% in the East Asia, 10.3% in Central and East Europe, 12% in West Europe and 7.3% in Latin America." Speaking on the effects of MBB over global indices, Mr. Dezfouli said: "Each 10% increase in the MBB penetration rate will increase the Gross National Product by 1.38%. Moreover, each 1% increase in the MBB penetration rate will boost the employment rate by 0.2% and ultimately result in 0.13% increase in the production efficiency." He further added: "By each USD $10 billion investment in MBB development, we will have 1.8 million new jobs opportunity in a 10-year-period. In 2007, USA managed to earn USD $300 billion as a result of increase in the MBB penetration rate which is 22% of the total earnings. Moreover, the total amount of exports made by manufacturing companies will be promoted by 6% while the total sales of service companies will also be raised by 10%." Referring to the reports published by the World Bank, Mr. Dezfouli explained that GNP (Gross National Product) will be increased by 1.38% for each 10% increase in the MBB penetration rate, and according to Analysis Mason Group, each 1% increase in the MBB penetration rate will result in 0.13% increase in the total production efficiency. According to Mr. Dezfouli, in 2017 in the United States MBB will result in more than USD one (1) trillion increase in GNP, while the amount was USD 141 billion in 2013. He declared: "The increase in MBB usage will result in easy deployment of more efficient business processes, introduction of new services and applications, access to existing resources, customers and workforce, which will ultimately result in enhancement of efficiency, innovation and productivity of the business. According to the ITIF, for each 1% increase in the MBB penetration rate there is 0.2% increase in the employment rate, and every IRR 10 billion investment in the development of MBB will create one (1) million job opportunities over a 10-year period." Dezfouli further added: by the year 2017, more than 1,388,000 new jobs will be created in the United States due to the development of MBB, while this number was 304,000 in 2013. Furthermore, the increase in the MBB penetration rate in the United States in 2007 has resulted in UDS 300 billion increase in economic efficiency (22% of total economic efficiency). Referring to the impact of MBB development on customer benefits, he said: In 1991, one had to pay more than USD 3054 to be able to enjoy all features and services which are now available on a smart phone. Referring to ITU announcement to the effect that MBB can increase the amount of manufacturing companies' exports by 6% and sales of services companies by 10%, he added: "Based on the existing information as well as the international experiences, development of MBB will make some of the objectives pursued by the resistive economy come true: Bringing about agility and dynamism and developing the macro indexes, resistance against the threatening elements, resorting to the local capacities, an approach of ever-increasing efforts, public-centricity, safety of the strategic and basic goods, reducing dependency to the oil, amending the Consumption Pattern, combat against corruption and becoming more knowledge-centered." According to Mr. Dezfouli, using MBB will help net savings in the costs of the English families to reach 270million pounds in 2024. In the same year, the saving amount in the free time of the English families as a result of broadband as the main platform for telecommuting is estimated to reach 60 million hours. Pointing out to ICT development trend in Iran, he said: Changes in the users' behavior and increased demand for using data services, need for more speed and better quality in data transfer, need to have permanent access to data services, the fact that 2G and WiMAX are old-fashioned and the related equipment and support are no more provided by the suppliers, development of the Information National Network and development of the broadband technologies (3G and 4G) as the permanent solution for integrated access to data services are among the requirements for broadband Internet development. Among the reasons for MBB development, Dezfouli mentioned: progressing in line with the 20-year vision, making the ground for development and generation of science and research, increased share in Gross Domestic Production in scientific productions, development and improvement of the software campaign and more emphasis on innovative approaches, realizing rapid, constant and continuous economic growth, entrepreneurship and reduced unemployment rate, active global interaction in all the sectors and effective cooperation in the global economy, protection of entrepreneurship, innovative actions and development of technical and research capabilities, reliance on the competitive advantages and crating new advantages, enriching the cooperation and private sectors as the main drivers of the economic growth, upgrading the capabilities and power of the cooperative sector and facilitating access to ICT resources, improvement and development of communications, establishing technical, economic and financial relations between the cooperative institutes, meeting the needs and requests of the youth and setting the ground for their active participation in the social issues and management of the elite. 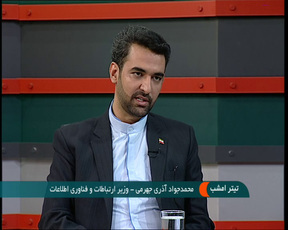 Referring to the impact of MBB on culture, he said: "4G provides the sages, experts, and the public with a better opportunity to have access to software and hardware facilities for producing and distributing cultural and religious contents and sharing them over the network, and thus to better introduce the Iranian-Islamic way of life. The service also helps to better enhance the culture of the society by increasing the rate of publications and distribution of scientific, religious and cultural contents as well as books, films, videos, national and folk songs and works of art at reasonable prices and in this way help the promulgation of the Iranian-Islamic culture across the world." Dezfouli further added: "Also noting that the service may provide a means for violators to spread inappropriate contents over the network, efforts have been made to prevent such thing by increasing the education and enhancing the culture of people through texts, images and videos. The vast provisioning of MBB for the whole society, regardless of the geographical position and time, also creates grounds for administering social justice in education, health and stable security." According to Mr. Dezfouli, MTN Irancell's MBB Network has provided the widest access to the national information network at the most reasonable price. With respect to the growth rate of income attained from different aspects of MBB he said: "Currently over 100 billion applications are being downloaded across the world every year, the produced income of which has been over 10 billion Euros in year only in Europe." He further added: "In 2013 about 1.8 million jobs were created merely in the content and application production area throughout the world." According to Mr. Dezfouli based on the information and experiences parts of objectives of the resistive economy will be realized by developing MBB. Dezfouli further added: "The 181% increase in the revenue of providers of content and applications, as activists in culture, by 2020 and the 22% increase in their revenue share from the total revenue generated in MBB ecosystem by then are among the other features." Mr. Dezfouli talked about the quantitative objectives of National Information Network, as being Iranian users' access to bandwidth of 20 Mb/s on the National Information Network, online payment of 80% of costs, online provision of 100% of government-to-government services, and connection of 60% of families and all businesses to National Information Network and Internet by the end of the fifth development plan. According to him, getting the 2nd place in the region for per capita of bandwidth and other ICT indicators by the end of the plan, obtaining 2% share of ICT in the Gross Domestic Production (GDP) by then, and connection of all devices to National Information Network are some of the features of launching this network. He declared: "Through increasing the bandwidth, there will be a great stride in GDP by the end of the fifth plan, and in view of the fact that the 10% increase in IT penetration rate causes a growth of 4.1% in GDP in advanced countries and 2.1% in developed countries, the most comprehensive and economical layer of access to National Information Network is provided through MTN Irancell MBB." Referring to the 132% increase in data usage he also announced that total data usage in October and November has reached the amount of more than 4000 (four thousand) terabytes, and that this usage amount in cities under Broadband Internet has increased by 132% compared to the period prior to launch. Dezfouli also reiterated that the speed for transferring data through MTN Irancell's MBB network is averagely 15 times faster than the previous generation, adding that MTN Irancell's 3G network presently covers 60% of its data customers across 75 cities throughout the country. According to Dezfouli, MTN Irancell customers presently have access to this operator's 3G network in the cities of Abadan, Astara, Arak, Ardebil, Orumiyeh, Asad-Abad, Isfahan, Andisheh, Ahwaz, Ilam, Babol, Bojnourd, Bandar Anzali, Bandar Abbas, Boukan, Boushehr, Baharestan, Birjand, Tabriz, Tehran, Dargahan, Dastgerd, Do-Gonbadan, Dowlat-Abad, Jolfa, Khorram-Abad, Khoy, Rasht, Rey, Zahedan, Zanjan, Saveh, Sarein, Saghez, Semnan, Sanandaj, Sahand, Shahin-Shahr, Shahre Kord, Sheyban, Shiraz, Torghabeh, Tous, Fasa, Qaem-Shahr, Qarveh, Qazvin, Qom, Karaj, Kerman, Kermanshah, Gorgan, Lahijan, Langroud, Marvdasht, Mashhad, Miamey, Mian-do-Ab, Hamedan, Yasouj, Yazd, Amir-Kala, Mahmoud-Abad, Noor, Astaneh Ashrafiyeh, Roudbar Ghasran, Doroud, Shahr-e Babak, Miyaneh, Izad-Shahr, Tonekabon, Rouyan, Ramsar, Kish and the new Sadra Town. MTN Irancell CEO pointed out that the company is planning to further expand its 3G network and increase the number of the cities under its 3G coverage by 170% by March 2015. Speaking on the features of MTN Irancell's 3G and 4G mobile CPEs, Dezfouli noted, "These CPEs are capable to connect to the 3G, 4G, EDGE and GPRS networks; they have monitors and SMS send/receive panels, they can easily connect to the Internet via USB cables as well as to Wi-Fi network and memory cards. Some of the CPEs have extra features such as connection to Internet via Rj 45 cable, data usage management panel and some can also be used as mobile handset battery charger."